We are going to show you how to make a healthy and delicious Salada de Couve Roxa com Castanhas, or Chestnut and Cabbage Salad. Hearty and flavorful, this is a unique Portuguese style salad which you will surely love. It is full of nutrients from the chestnuts along with the cooked red cabbage, it is the perfect way to eat healthily without sacrificing taste. 1) Boil the chestnuts in a saucepan. Once done, peel them and set aside. 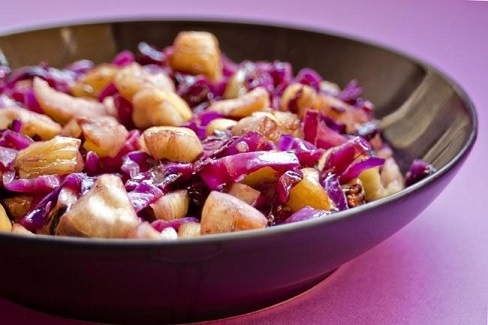 2) Cut the red cabbage into thin strips and cook it in a pan with a tablespoon of olive oil until softened. 3) As it is cooking add the wine. 4) Break apart the chestnuts and add them to the pan. 5) Season with the salt, pepper, and balsamic vinegar to taste. 6) Continue cooking until the cabbage is well cooked and soft, add water if necessary. 7) Once done, serve on a plate and enjoy!